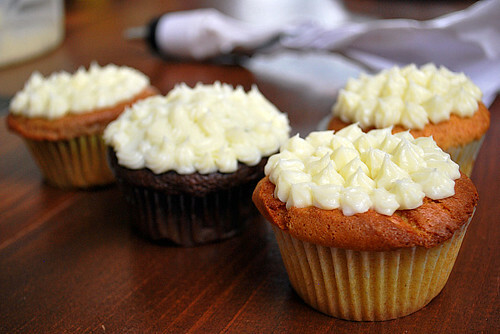 * Add ins include: nuts, baking chips, fresh or dried fruit, peanut butter, Nutella, pumpkin pie filling, etc. Preheat oven to 350 dregees. Combine all the above ingredients in a bowl, mix with a mixer (hand held or stand mixer) for 2 minutes. 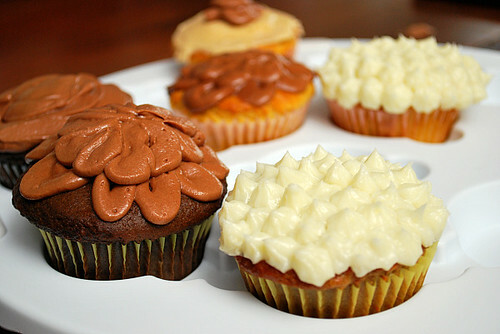 Pour into lined cupcake liners and bake in preheated oven for 12-18 minutes until golden brown and done. 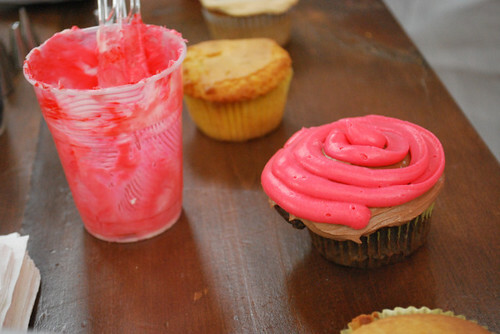 After we finished making the frostings, it was time to decorate! 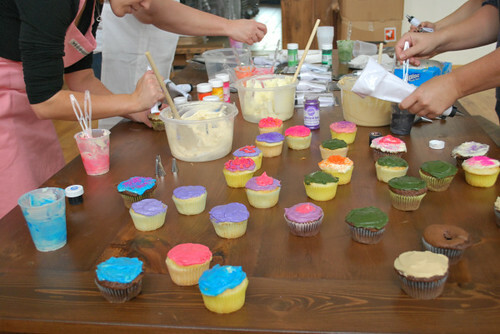 Various colored sprinkles, color gels and decorator tips were available for everyone to get creative. 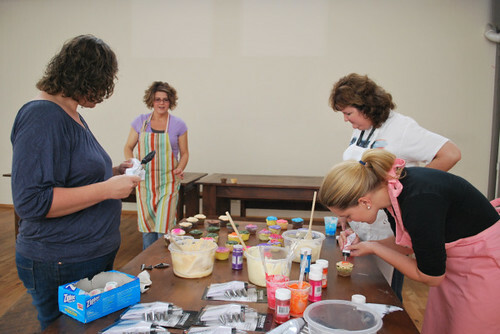 I plan on hosting a second Cupcake Bootcamp dedicated to decorating, learning more about frostings and the different consistencies next month so stay tuned! 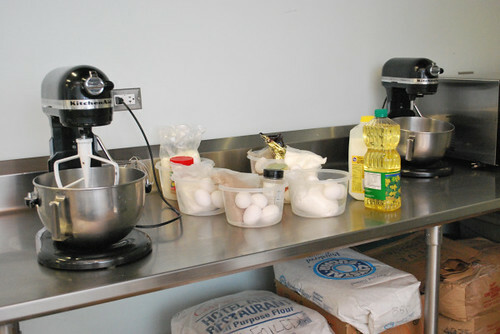 In standing mixer fitted with whisk attachment, beat butter at medium-high speed until smooth, about 20 seconds. Add confectioners' sugar and salt; beat at medium-low speed until most of the sugar is moistened, about 45 seconds. Scrape down bowl and beat at medium speed until mixture is fully combined, about 15 seconds; scrape bowl, add vanilla and beat at medium speed until incorporated, about 10 seconds, then reduce speed to low and gradually beat in chocolate. Increase speed to medium-high and beat until light and fluffy, about 4 minutes, scraping down bowl once or twice. 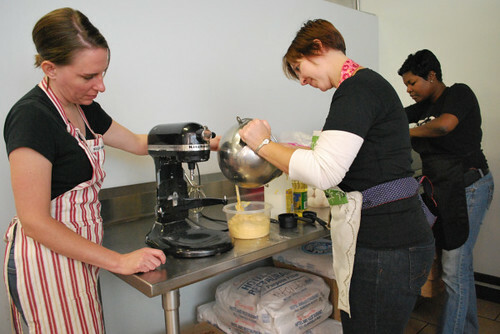 In standing mixer fitted with whisk attachment, beat butter and peanut butter at medium-high speed until smooth, about 20 seconds. 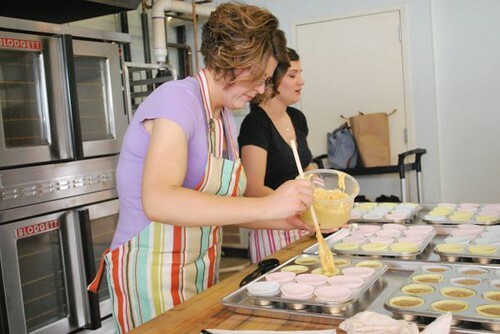 Add confectioners' sugar and salt; beat at medium-low speed until most of the sugar is moistened, about 45 seconds. Scrape down bowl and beat at medium speed until mixture is fully combined, about 15 seconds; scrape bowl, add vanilla and heavy cream, and beat at medium speed until incorporated, about 10 seconds, then increase speed to medium-high and beat until light and fluffy, about 4 minutes, scraping down bowl once or twice. i have to be honest I don't get the cupcake thing either but when the mood strikes, I don't mind shoving a cupcake in my face either. Thanks so much for sharing all these recipes!